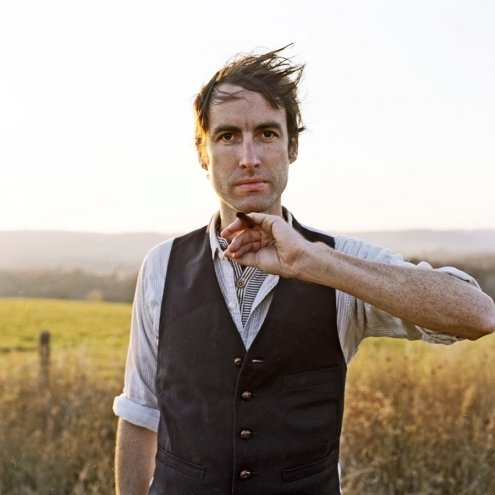 One could arguably describe Andrew Bird as the quietest, most exquisite big deal in the music business. His last album Noble Beast (2009) sold 150,000 copies in the US alone and debuted on the Billboard chart at #12. He also has cumulative album sales of well over half a million and is fast becoming somewhat of US TV veteran after appearances on The Late Show with David Letterman and The Tonight Show with Jay Leno. In the intervening three years since Noble Beast, Bird, a man who sometimes structures his live sets by selecting thematically linked songs, has continued the rigorous touring that has made him one of the hottest concert tickets around (and not just in the United States where he played to 50,000 people on his headline tour for Noble Beast – a barely announced headline show at London’s Barbican Centre in the spring is nearly sold out). First staged at New York’s Guggenheim Museum in 2010, where Bird performed through some fifty of Schneller’s amazing handbuilt speaker horns placed all round the venue, this ongoing experiment has been hosted this December at Chicago’s Museum of Contemporary Art, with Bird providing new site specific compositions. That’s not the case here. The tongue-twisting and catchy future single ‘Eyeoneye’, is as alive as recorded sound gets. “The DVD has film of us performing the actual take. Three quarters of the way through something clicks and it injects some adrenaline,” says an enthused Bird. ‘Lusitania’, a country-flecked duet with Annie Clark aka St Vincent, a sometime touring partner and intuitive collaborator, holds the listener close in its embrace (and features a divine couplet in “You’re laying mines along your shore/ Through my hull it ripped and tore). Bird’s lyrical flights have been commented on. “I’ve been accused of being wilfully obtuse,” he concedes. But he’s happy with these songs. “Lyrically I’m closer to the bomb. I handle topics not often handled in pop songs.” Certainly, the wonderfully frisky opener ‘Desperation Breeds’, using the reported extinction of bees as a metaphor, is highly original. But the lovely melodies of the gorgeous and deeply unusual ballad ‘Sifters’ (surely worthy of reinterpretation- “No one’s covered one of mine yet,” he says) and the gloriously imaginative ‘Lazy Projector’ are just as striking. “Who the hell is editing the story of what you were? Who inside my head decides what I choose to remember?” he says, explaining the latter. Given that, the line “I can’t see the sense in us breaking up at all’ become even more plaintive and affecting. During the song’s mixing, the great Randy Newman popped by “at half an hour’s notice. He’s a very perceptive man,” says Bird, “He was gesticulating, shouting ‘it’s like a different song’.” He was right. Half of the composition was originally commissioned for The Muppets movie soundtrack, of all things, another of Bird’s ongoing interests (Bird’s own unique version of ‘It’s Not Easy Being Green’ was on The Muppets tribute album and he did appear on the movie soundtrack with ‘The Whistling Caruso’). Prettier still is ‘Fatal Shore’, with Dosh’s heart-stopping punctuations leaping out. “There’s your morning songs and there’s your late night songs…,” says Bird, making it clear what time it was put to tape. But Break It Yourself has a wider reach than simply a.m. and p.m. The entirely self-played ‘Hole in the Ocean Floor’ is reminiscent of Bird’s immersive solo shows, created from loops (it also allows room for his voice to truly reveal itself), while ‘Danse Carribe’ attempts to track a style from the American South to distant Trinidad. Bird even evokes Exuma, a seventies Bahamian band described as “a Caribbean Parliament” (as in the P-funk creators, not a political institution) and Niger’s Etran Finatawa. ‘Give It Away’ is a relatively straightforward pop song, its loose chorus shaking itself free. Yet the fiddle led ‘Orpheo Looks Back’ with its energetic drones straddles the line between Celtic and North African music, perhaps not so surprising for a man who grew up playing Irish songs as well as classical violin, while the closing ‘Belles’, a minimal loop with crickets chirping underneath, is pure Bird-balm. In short Break It Yourself is as warm-hearted and eclectic as ever. It sounds like all the music and no music you’ve ever heard, from jazz to country to classical to folk and pop, visiting a thousand exotic places along the way and the public has no problem with that. Pondering his increasing popularity, which can’t simply be put down to a hard work ethic, Bird suggests why he has registered with a much wider audience. “People have been exposed to more and different things – palate is the right word. It’s a sensory thing,” he says. The implied food comparison seems apt, the ingredients don’t necessarily produce what one expects but that doesn’t make it any less enjoyable. As he says of his music, “It’s about the company you keep.” And what exquisite company it is.